I was stationed at Kagnew from 1967 through 1969 and loved every minute I was there. The Eritrean people are the most amazing people in the world. They out do any civilization on earth. I remember every minute I was in Asmara and once in Massawa for two days. All the houseboys, waiters, ghari cart drivers, shop owners, street vendors, and just every day beautiful people were absolutely the best and so incredibly honest. No one compares to the love I have in my heart for Eritrea and its people. Words escape me as how to describe my feelings for Eritrea and its people. Love, respect, honor, admiration. Just a few words I feel for them. Your site is beyond anything I have ever seen. I thank you from my heart for having the insight to organize such a site. Your travels are well documented without over doing it. I received this very inspiring feedback on my earlier travel stories on April 18 2009 from a 60 year old retired military man living in New Hampshire, USA. We both share the same memories of a people so exceptional that each visit is worth every dollar spent on the trip, even after so many years. This diary will again be the convincing evidence that Eritrea is safe, hospitable, and a social adventure. And the fact that I can share the pictures with both Eritreans, and men like John, makes it very worthwhile to capture every day of my visit in a set of pictures and a few lines of text. 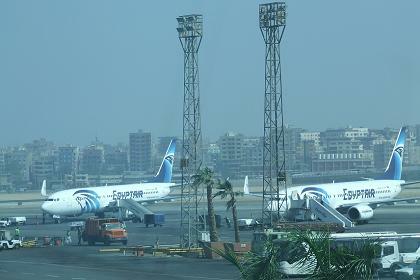 The flight with Egyptair (Amsterdam - Cairo - Asmara) is a bit fatiguing with a transfer very early in the morning in Cairo, and waiters at the airport trying to cheat passengers, unaware of the exchange rates. 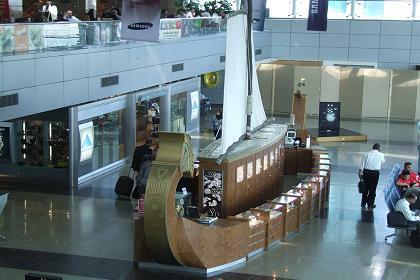 Lounge and Shops - Cairo International Airport.